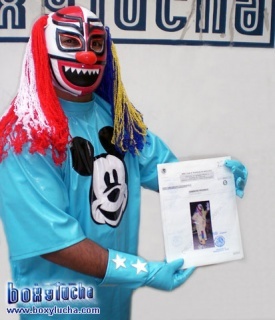 In the following days the unmasked Cocolores showed papers to claim he was the original one, but Fantasma sided with the still masked one claiming that a fraude occurred in FMLL card. A fraude worsened by the "return" of Coco Amarillo and Coco Azul, re-introduced as the AAA originals but masked. This could not be the case, as the real ones were the first unmasked as El Indomito and the second switched back to El Engendro identity and then gave the gimmick to another one that lost his mask too to Octagon. The original Cocolores continues his lucha career occasionally teaming with Coco Blanco and managed to claim Hermano Muerte II's mask after a long feud. An Arkangel de la Muerte trainee, he appeared in the opening battle royal on his trainer's 25th anniversary show. This page was last edited on 20 July 2011, at 21:49.